Each August, the city of Chicago comes alive with a celebration of our Polish community as the Southside Polish Fest begins on August 16th and continues until August 18th. This three day festival celebrates everything Polish, and gives our city’s Polish community the opportunity to share their culture with us. 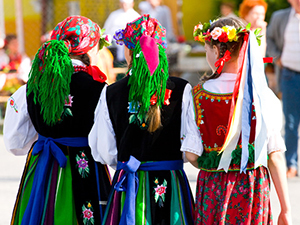 This year, the festivities are set to include live music, Polish dance, carnival rides suitable for all ages, and, perhaps the best part, traditional Polish food and beer! The Southside Polish Fest takes place at the world famous Toyota Park on August 16th from 4PM until 11PM, Saturday August 17th from 12PM until 11PM, and Sunday August 18th from 12PM until 11PM. General admission tickets are $10 each with a special price of $5 offered on Saturday and Sunday between 12PM and 1PM. Admission is free for children under five and military personnel in uniform with an active military I.D. Free parking is available when tickets are purchased online here. Southside Polish Festival is still looking for sponsors, vendors, and live bands. If you’re looking to take part in this exciting event as a sponsor, vendor, or musical act, please contact event organizers by calling 708-378-0102. For more information about the Southside Polish Fest, please visit the event’s website. The Southside Polish Fest has quickly become the largest celebration of Polish traditions in the United States. The goal of each year’s festival is to out-do the previous year making the Southside Polish Fest a must-see attraction in the Northeastern United States for people of all ethnicity and cultural backgrounds. Each year, the Southside Polish Fest features an annual Pierogi eating Contest. To compete in this year’s pierogi eating contest, sign-up before hand, here. While in the Chicago area, either to take part in the Southside Polish Fest as a guest, vendor, or musical act, guests of the Best Western Inn & Suites Midway Airport Hotel enjoy a convenient location just 3 miles from the Chicago Midway Airport. Our hotel is also very close to Toyota Park making travel between the Southside Polish Fest and your hotel room very easy. In addition to our hotel’s convenient location, guests of the Best Western Midway Airport Hotel enjoy the comfort of an indoor swimming pool and hot tub, exercise facilities, complimentary continental breakfasts, as well as cable television in every room. Our rooms are clean comfortable and affordable. Guests of our hotel will find our accommodations wonderful, and our staff friendly. The Best Western Midway Airport Hotel is the best place to stay when looking for a hotel in Chicago. For more information on being our guest, please call us at 1-877-891-7666 or contact us.